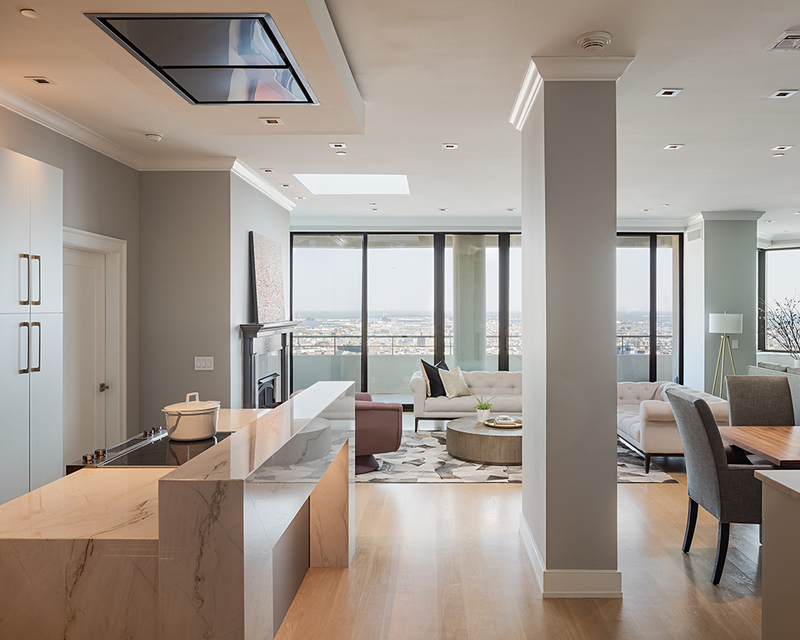 teammates: General Contractor: Main Line Craftsmen, Inc.
Overlooking Philadelphia’s Rittenhouse Square, the Rittenhouse Penthouse was a dated mix of dark wood paneling, mirrors, and marble. 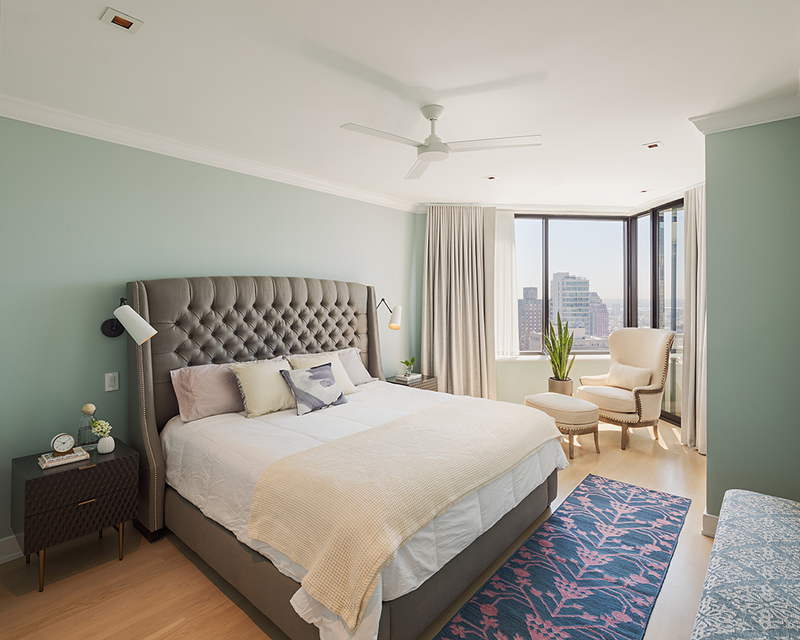 inHabit provided architecture and interior design and collaborated with the client on furniture selection to create a bright and open residence for entertaining that feels more like a breezy beach cottage than a luxury high-rise condominium. 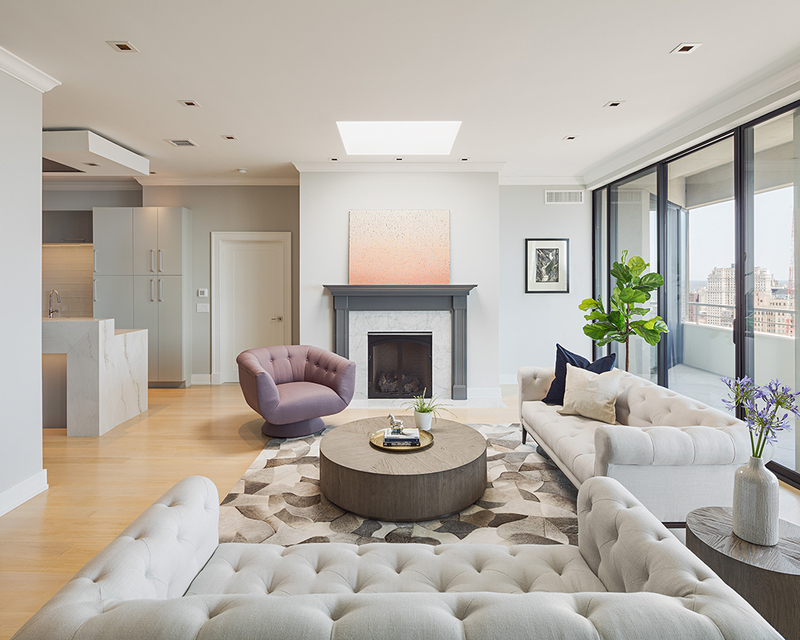 Architecturally, inHabit opened the compartmentalized floor plan to maximize natural light. Most of the interior partitions were removed to create dramatic views through the living areas. Wasted space in an oversized entry foyer was captured to add a sleek, modern kitchen. Relocating the kitchen meant a plumbing puzzle, since only the apartment’s existing drains could be used. The kitchen’s new position was achieved by utilizing a former tub drain made available by renovating the master bathroom. The client wanted only a walk-inshower, freeing up a drain, and by doing so, enabled the new configuration where both rooms meet their best purpose. 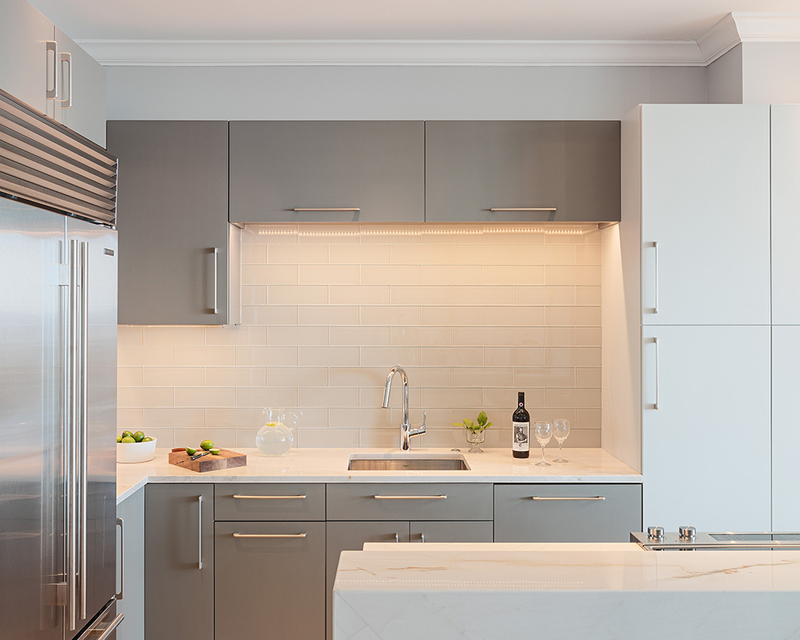 Since it is the first visual upon entering the residence, the kitchen’s subtle hues don’t call attention to its function, but rather guide the eye – by way of a sleek white quartzite-clad island – toward the city views. 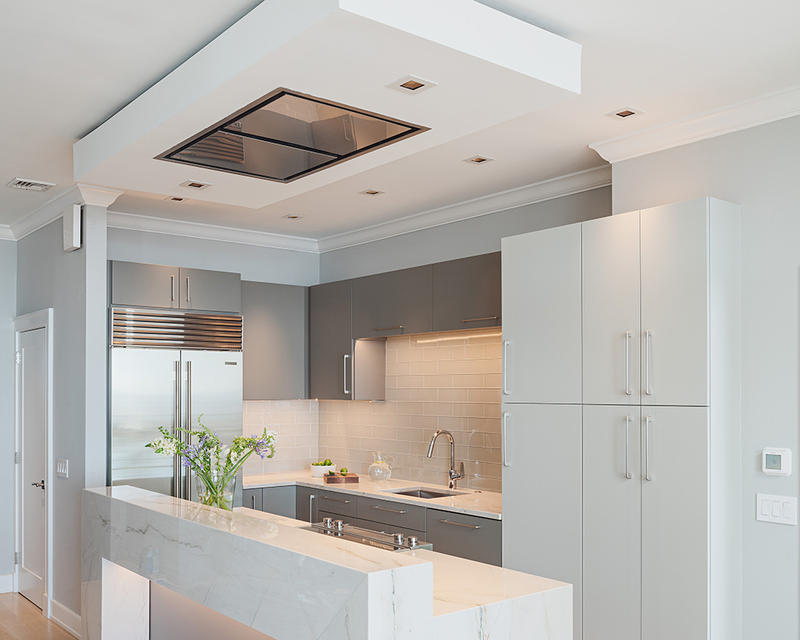 A subdued ceiling-mount vent accentuates the room’s high ceilings. Glass backsplash tile and soft gray custom cabinetry don’t compete for attention but exude quality. The custom cabinetry continues into the familyroom, where built-in shelving conceals a Murphy bed for guests. A new firebox, mantel, and surround anchor the living room’s seating area. 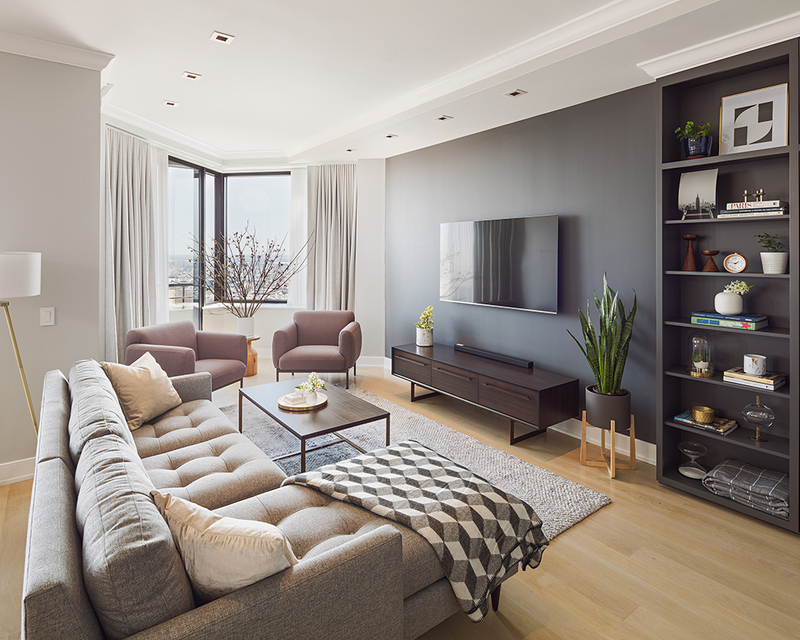 Shades of green and gray continue the relaxed aesthetic through the apartment. The floors were stripped to the concrete slab and replaced with pale wood stained in place. Living room painting above fireplace © Keith R. Breitfeller and photograph © Christopher Brown, both courtesy of inLiquid.